"The night Kate Harker decided to burn down the school chapel, she wasn’t angry or drunk. She was desperate. 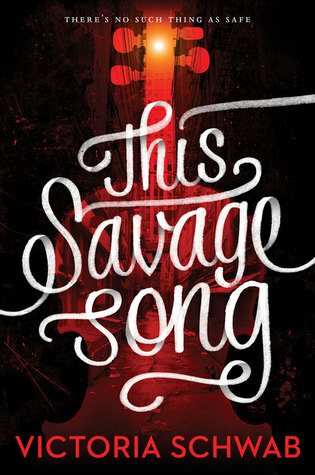 I just finished This Savage Song and it was such a thrilling book. The monsters, worldbuilding, and character development are all outstanding, and I felt compelled to make this my First Chapter First Paragraph Tuesday Intro for today! *Excerpt taken from the novel itself; I do claim to own any part of the excerpt. This one looks interesting. I went and read the blurb and I'll be watching for it at my library. Sounds like one I'd enjoy! Thanks! This does sound like fun Jordan and I'd certainly keep reading after that opening - I want to know why she needed out! I am glad you enjoyed this one, as it really does sound good. I like opening you shared. Someday I will read something by this author--I'm determined! Great intro and glad to know that you liked it. This looks intriguing although not my usual genre. Glad you enjoyed it. Happy Reading! YES!! I have this book but sadly haven't even opened it yet.